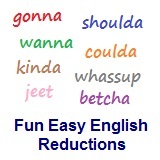 ﻿ Fun Easy English - new classroom free online classes english language lessons speaking listening writing reading november 13. Today in the Fun Easy English classroom you are going to learn "musta" an American English reduction. Parmalee "Musta Had A Good Time" - Parmalee is an American country music band. This is their song "Musta Had A Good Time" with lyrics written in English. Use a dictionary to look up words you do not understand.